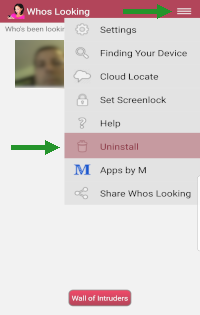 If you can't uninstall the app you may need to remove it as a 'Device Admin' first. This can be done though your device security settings. If you setup your Gmail to use your Google Drive, and your Google Drive runs out of space you will not be able to receive emails. Your storage is shared across Google Drive, Gmail, and Google Photos. To see how much space you have left, go to google.com/settings/storage on a computer. Location not accurate when using your phones Google Maps app. Viewing location link using a browser provides better location accuracy then using the phones Google Maps app. 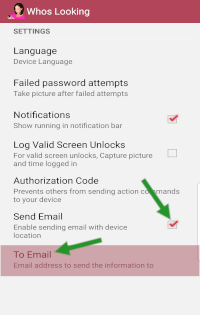 Verify by failing a screen unlock attempt to have an email sent with the location of your phone. View the same link with both options to see which one displays the actual location better. Do you have a task management app? 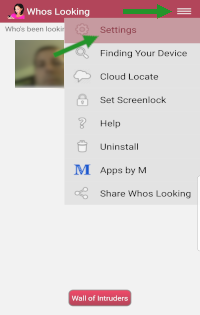 Apps like these are likely to kill Who's Looking while it works in the background to get your phones location. Solution: Add Who's Looking to your task management apps exclude list, so it doesn't kill Who's Looking. GPS may not enable by itself on all phones. To ensure the GPS feature works, enable both GPS and network-based location from within the GPS setup menu. GPS can fail to find the exact location of a device if too many material obstructions are in the way of the satellite signal. The most common places for GPS to fail are in hospitals or metal roofed office buildings. When the GPS application fails to get a clear reading of the latitude and longitude, the app will then send the user the network-based location of their device. The network-based location is the location of the closest cell tower to the device and could be several miles away from the actual location. Satellite locations are constantly changing because of the curvature of the Earth so if the GPS fails to get the exact location try again at a different time during the day. Who's looking will use the front camera to take pictures of someone trying to unlock your phone. Most devices do not have a flash for the front camera, so if the lighting is dark the picture will be dark as well. You will still know when the person tried to look at your phone and with the Pro version the location. If the device is off or has a dead battery will the app still work? No, it's impossible for any app to run without the device being on. For example, your computer can't conduct a virus scan if it's turned off. Can you make the app turn GPS on if it is off? Yes and no. The app will try to enable GPS anytime that it needs it. On some newer phones Google has removed the ability for us to enable GPS for you. The app does not enable GPS for me, why? While the app does try to enable GPS on all devices it may not be able to for your device. In this case we recommend leaving GPS on if you want to be able to use this feature. But doesn't leaving GPS on drain my devices battery power? No, a lot of people think that leaving the “Use GPS” and “WiFi Location” boxes unchecked will result in better battery life. This is not true and here is why. The "Use Wireless Networks" and "Use GPS Satellites" are permission settings. These settings ONLY allow/disallow applications to use wireless networks and/or GPS to get the device location. These settings do not turn on or off any hardware, therefore is does not save your phone’s battery to have them enabled. Applications turn on/off the GPS when they are using it, and you can tell when this is happening because a GPS icon will appear by the clock. So leaving "Use Wireless Networks" and "Use GPS Satellites" on does not affect battery life, it just gives permission for apps to get your location. If you are experiencing power drain when GPS is enabled, you may have an app that is running in the background using the GPS. You should find that app and change its settings or remove it so it stops using GPS. I used the GPS function and the location is way off, why? If a thief found my device, they could just uninstall the app, can you make the app need a password to uninstall it? No, for your security Google does not allow Android apps to password protect their un-installment. Google does this to protect you from vicious apps that could harm your device and not allow you to remove them. I forgot my Cloud Locate password? From Find Device/Cloud locate login screen, select "Forgot Password" link to reset. What is the authorization code used for? This is an optional setting. The authorization code gives you another level of security. When using the Find Device/Cloud Locate, after you login, you will need to enter this authorization code to be able to send the action command to your device. I lost my device and can't remember my authorization code. What do I do? For your security we do not keep your authorization code on file. It is recommended that if you write your authorization code, write it down in a safe place. Full network access - This is used to do the street address lookup when you get the GPS location of your device. Also needed for the email feature to send outgoing emails. Fine (GPS) location - This is needed to get your devices GPS and network-based location. Draw over other apps - Needed as part of capturing invalid screen unlock attempts. Take pictures and video - This is needed to access the camera. This is used to take the picture of who is trying to unlock your phone and also used to take pictures remotely to help track down your phone. Modify/delete SD card contents - This is needed for the camera feature, it allows the app to save the image to the SD card.